You are responsible for all the materials checked out on your card. 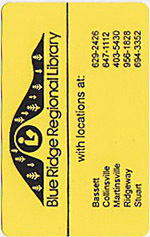 If you should lose your card, let the library know right away so that no one else can use it. There is a $2.00 replacement fee for lost cards. Also, if you change your name or address, it is important that you notify the library so that your records can be updated.